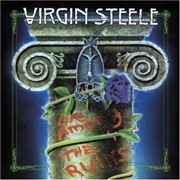 Formed in 1981, VIRGIN STEELE has released a massive eleven albums, which are now in the process of being re-released. From the first line-up of Jack Starr, guitars, Joe Ayvazian, drums, who recruited a phenomenal vocalist by the name of David DeFeis, who, in turn, brought bass man Joe O´Reilly, until the complex metal opera band of today there has been a long and winding road. Guitarist Starr soon left, in pursuit of the direction of their two first, more heavy metal meets RAINBOW-orientated albums. In came Edward Pursino, who is rumored to have just entered and never left, and the operatic era was taking form. Around 1988 the band entered problems with the commercial failure of the “Age of Consent” album, and when bassist Joe decided to retire from the scene the band broke up. Which brings us to the re-released album “Life Among the Ruins” some five years later. Do not expect the same old heavy metal with grand portions of epic mythology. Nope, this was the band´s venture into WHITESNAKE territory with a mix of the then ailing hair metal and some doses of Messrs. Coverdale and Plant. There might be doses of hard rock, piano parts, forceful refrains, blues rock of a fine pedigree, power ballads above average, but I still believe it is hard to muster if you started listening to “Metal City” roughly ten years earlier. What I like about this album is the very impressive blues style of “Snakeskin Voodoo Man”, and the power ballads, or thereabout, of “Never Believed in Goodbye” and “Wildfire Woman”. They sure were taking into consideration what has just been popular at the time, but they must have missed out on the grunge misery and the decline of hard rock and heavy metal, as we loved it. The songs are not bad in general, apart from the over-buttered dreadful Julio clone “Last Rose of Summer”, which, to top it all, closed the original album. This edition contains a massive 25 bonus tracks, which are for you to discover…if you dare. CD 2 "My Mourning Clothes"